Interactive Law operates a number of different legal web sites, each of which deals with a different topic of law. Each web site provides the visitor with a wealth of information designed to answer the most frequently asked questions. For those individuals who need to instruct a Solicitor, each web site has a panel of solicitors which deal with enquiries, generated by the website, in their own local area. Visitors to the sites can search for their local solicitor by simply entering their postcode, which will return up to two practices covering that district. As the practice's contact details are listed, the visitor is able to email or telephone the practice directly from that page. If they are using a smart phone they simply need to tap on the telephone number in order to make a call. For those visitors who are not sure if they need a solicitor, they can call our call centre. It is a local rate number and our call centre staff will evaluate whether the caller needs to speak with a solicitor. At this point the client is free to make direct contact with you by telephone, email or via your own website. As an alternative to searching for a solicitor our visitors can call us direct. This allows us to filter out enquiries which just contain questions or where a mediator may be more appropriate. This in turn greatly reduces enquiries which just contain questions or are from people looking to get a bit of free advice. Once an enquiry has been passed to you that is when our involvement ends. There is no requirement for you to inform us whether you are acting for the client, as we do not 'recycle' rejected enquiries. You are free to deal with all enquires how you see fit and you are not under any obligation to contact the client if you don't want to. Unlike claims management companies, we do not charge referral fees. To maintain the web sites and fund the service we provide, all our legal panel members pay an annual subscription fee. Below is a list of the sites we operate along with a brief description. Contact us today for further details on legal panel membership. Potential clients are offered three ways to make contact with a solicitor; by using the “search for a solicitor” tool or by filling out the enquiry form on the top right hand corner of the page or they can call the local rate number. 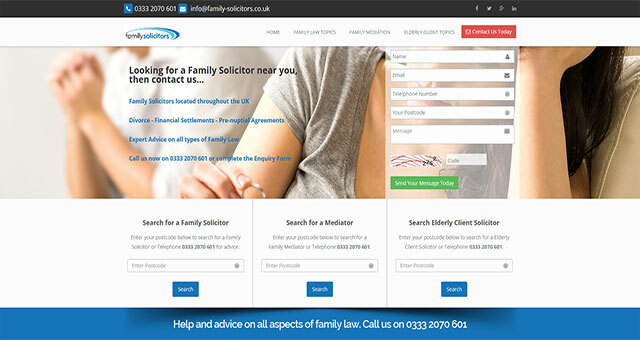 The Family Solicitors website has a mediation section with its own “search for a mediator” search tool; this connects with a separate panel of local mediators. This website has a separate panel of solicitors that deal with Elderly Client and Private Client matters. Highly ranked with Google, this website is well established and extremely reliable for the end user. The employment solicitor’s website is a well-established, informative, fully responsive, website. 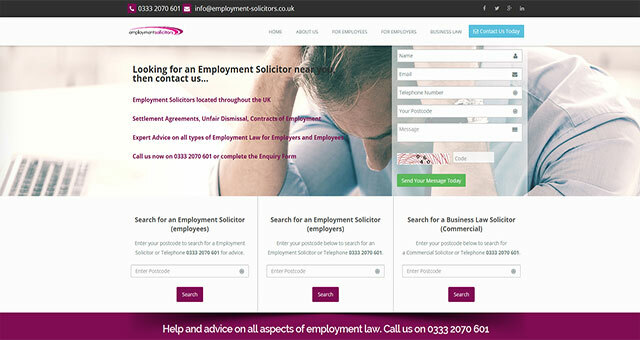 Designed with the end user in mind, the site allows an individual to search for an employment solicitor using the “local search tool” there are two panels of solicitors for employment law, “employee” and “employer”. There is a third panel of solicitors dealing with business law, aimed at local SME’s looking for advice on business law. An individual can read up on the information relating to their situation and then make contact with the local panel member direct. There is a quick form at the top of the page to send in a question and there is a local rate number available on every page. The professional Negligence website, supported by a panel of solicitors specialising in this complicated area of law, has excellent Google rankings. An individual has the opportunity to research information relating to their situation, helping them to decide whether they may have suffered Professional Negligence. 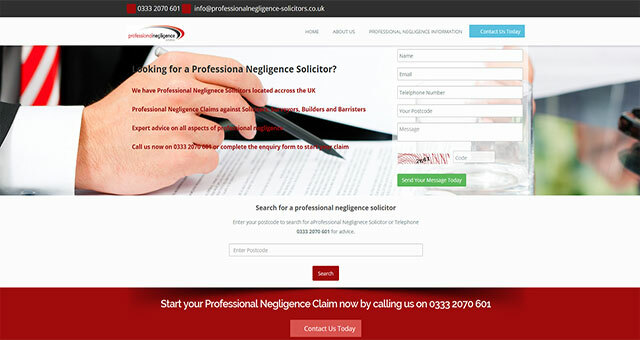 The site provides a search tool to enable an individual who thinks they may have a negligence claim, to contact a local solicitor. There is a contact form on every page allowing an individual to ask a question, there is also a local rate telephone number. 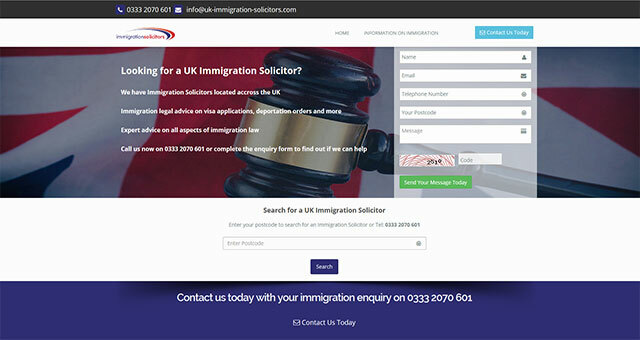 Our uk-immigration-solicitors.com website is one of our more recent sites and deals provides the public with a wide variety of information on different aspects of immigration law. Immigration Law is becoming an increasingly more popular with legal practices and the demand increases for visa applications and appeals against deportation orders. If your practice is interested in dealing with some regular immigration cases then contact us today for further information. If you are looking for an immigration solicitor then please visit the above website.